Hey ya’ll! 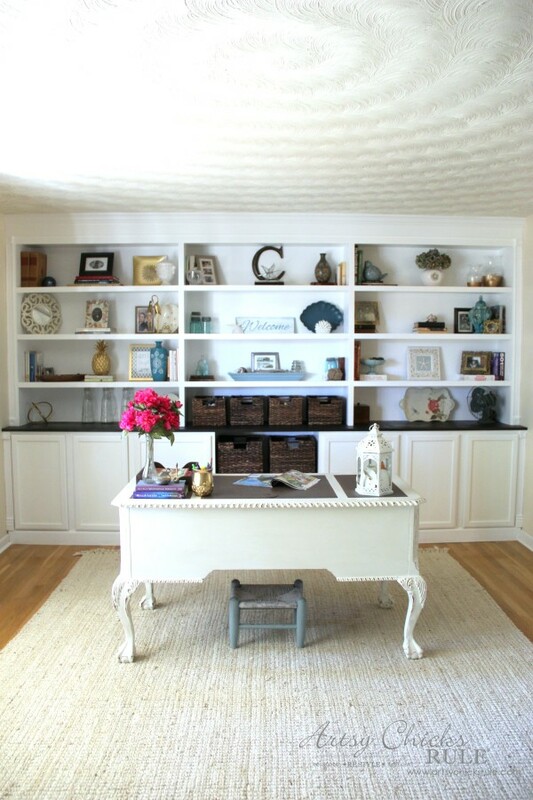 I’m finally sharing the DIY Bookcase Tutorial in this room…. I know, it’s been a long time coming but so was the bookcase! And I’ve had my hands a little full….we got a puppy. His name is Ryder and I’m quite sure you will see him in and around the blog from time to time. I shared about him over on Instagram a couple weeks ago….. I even started an Instagram for him too. 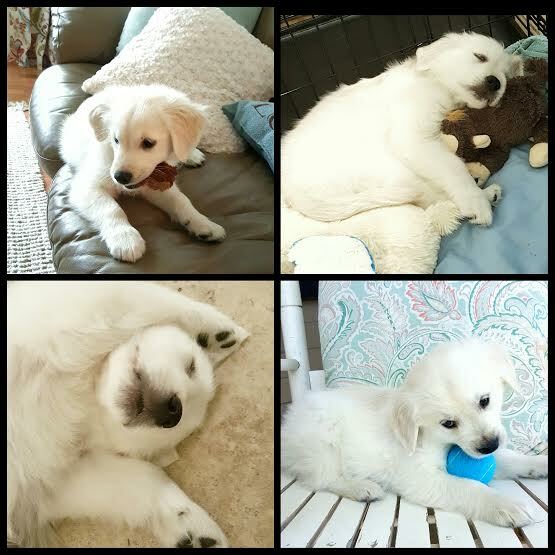 I thought it’d be a great way for family and friends to keep up with him…and his growth from puppy hood to adult hood. Okay, now let’s talk DIY BOOKCASE TUTORIAL, y’all! I should put a bit of a disclaimer out here right now. No reason at all for that except we were busy and kept putting it off. Ugh. So, with that, the tutorial may not be the best but I’ll try to piece it together for you. Here’s the finished DIY Bookcase that I’m speaking of…..
I’m so very happy with how it turned out. 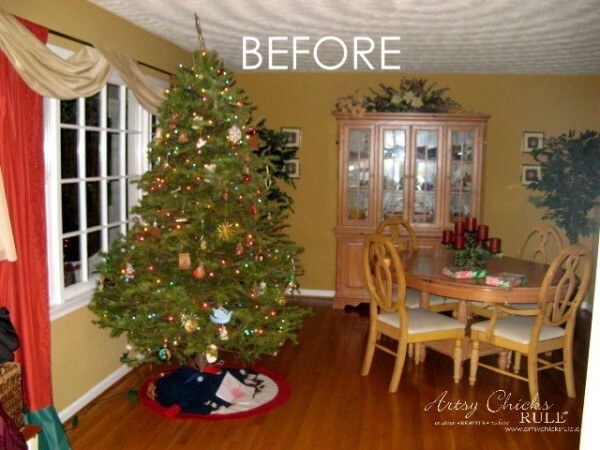 It really added a lot to this room. This was when I used it as a “dining room” instead of a study. I may include some affiliate links for you below. You can see my full disclosure here. We decided to use ready to go cabinets from Lowe’s or The Home Depot. I don’t remember which now and it doesn’t really matter. They both have a similar style. We considered using base cabinets but ultimately, I didn’t want them coming out that far. However, I did want them to come out a bit farther than what wall cabinets would give me. 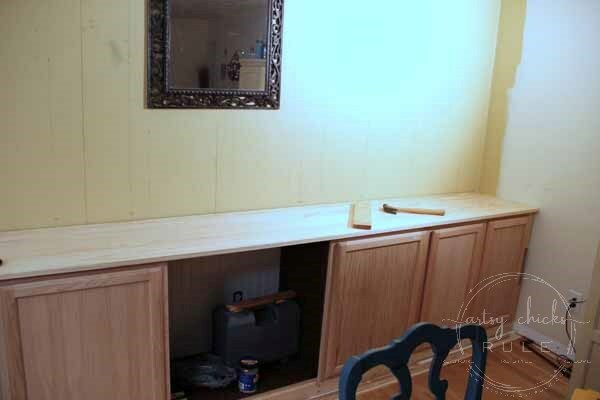 So, we adjusted the wall cabinets depth, like so…. We built a base for them to sit on out of 2×4 pieces of wood. Then, as you can see, we pulled them away from the wall about 4-5 inches. 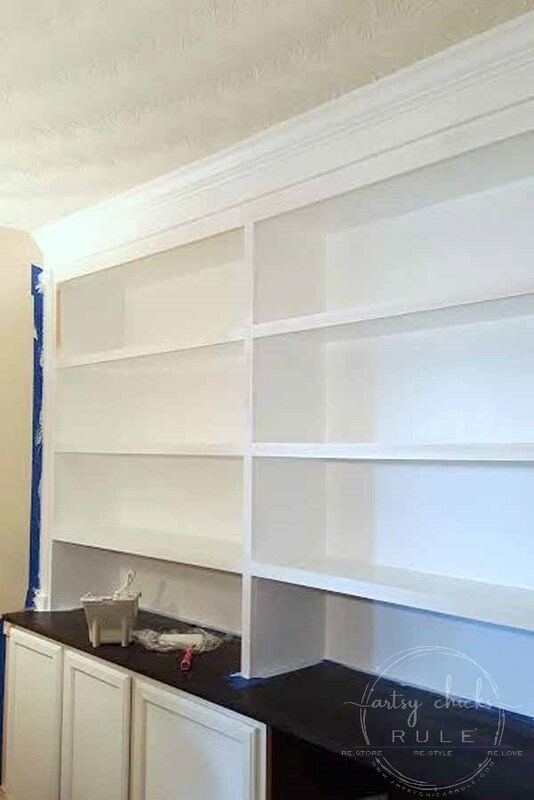 We left space on each side of the bookcase to allow for decorative trim also. You can see to the very left of the picture below. 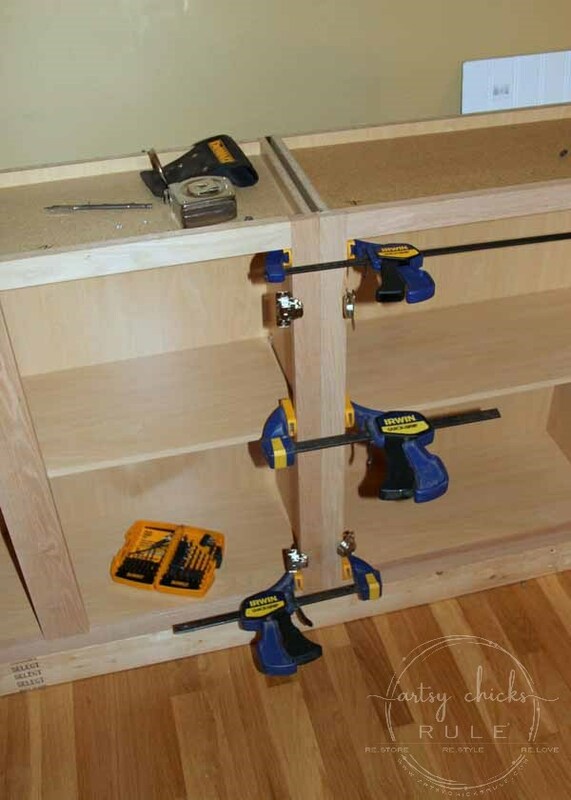 You can measure and use whichever size cabinets that your space requires. Next we screwed, and glued, the cabinets to each other. I wanted to break up the bottom section so left a space in the middle open for a shelf and baskets. We added 1×2 strips of wood to the wall behind as “nailers”. I had originally planned to put bead board on the entire back of the bookcase but changed my mind. That’s what happens when you take 2+ years to complete a project! We had several “change my minds” along the way, haha. 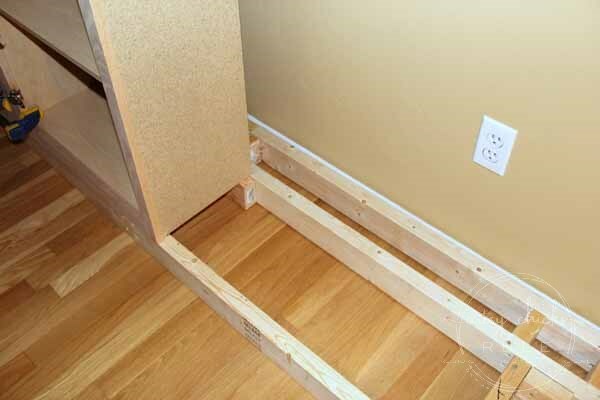 Instead, we used flat wall panel board. 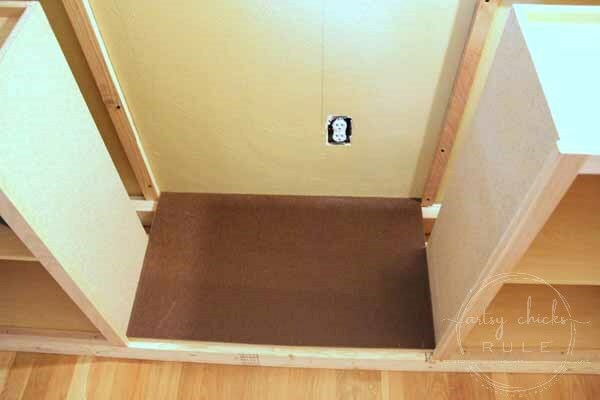 We removed that bead board at the back and replaced with the flat wall panel board but don’t have a photo of it. At least the entire wall wasn’t done yet, right? 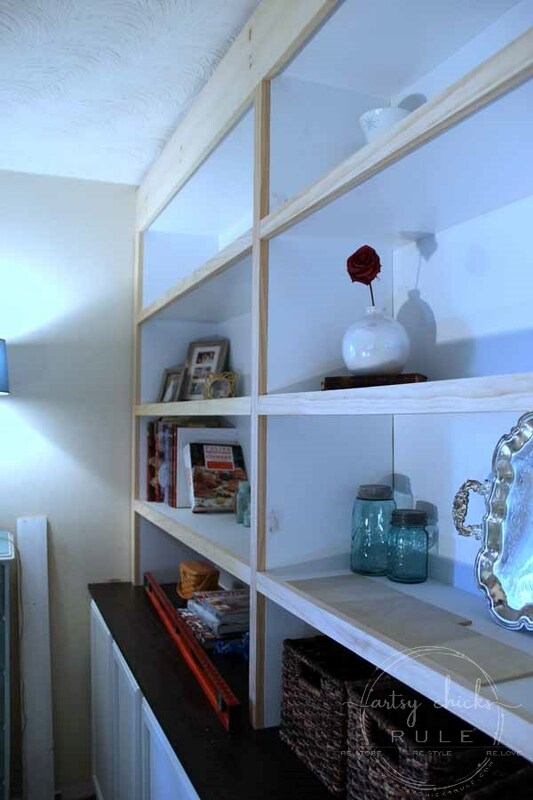 The middle shelf in that opening, (not shown), is made with 1×6 pieces of wood. I wanted to have a dark stained wood top so my husband and I made one. 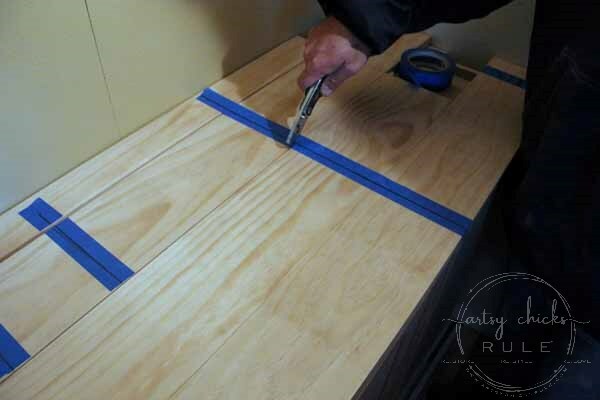 Lining up the pieces with painters tape to glue the biscuit joiners. We used biscuits to join the wood. The tops/shelves were made from 3/4 inch cabinet grade plywood that my husband ripped down. He recommends using 1×12 pieces, however. It’s easier! You only see two, um, because there were only two. Until I changed my mind….again. I was going to have an open space in the center of the upper cabinets for a large print/painting originally. I decided I wanted to keep it “easy” and just have shelves go all the way across. So we ended up building another one of these to go in the center. I also considered just painting the back wall and not having a back on these. Old house, non straight walls, etc. That really wasn’t going to look very nice so we opted to add those flat, smooth wall panel boards to the backs of these. No photos of that, sorry. At this point in the game, I just wanted them done and my house put back together! 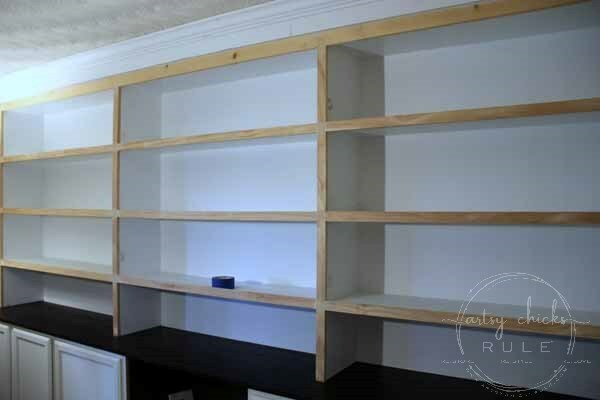 I also don’t have pictures of installing these shelving units, etc. Basically…we slid them into place and then screwed them to each other and the wall. Yes, I have “stuff” on the shelves. You would too, if it was a 2 year project. But anyway, you can see how they are “put together” above. Not very attractive, huh? But wait. 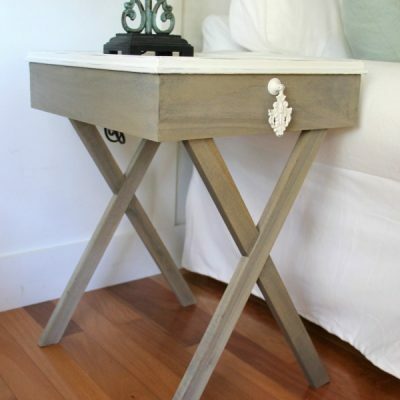 You’ve gotta add the trim to make it pretty and finished. We used 1×2 inch pieces for the shelves. The shelf sections ended up with a little “lip” area. I like the look that created. The very top got a 1×8 that didn’t need to go to the ceiling because we were adding crown molding there. You can see I have some caulking to do too. I stained the top piece with Java Gel Stain. It’s a little darker than I wanted. 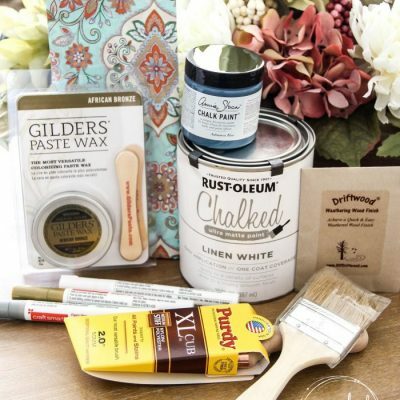 I should have mixed it with Antique Walnut (my fave go to blend). Oh well, I’ve gotten used to it and it’s staying that way now! For the sides, we used fluting and rosettes to add a decorative touch. 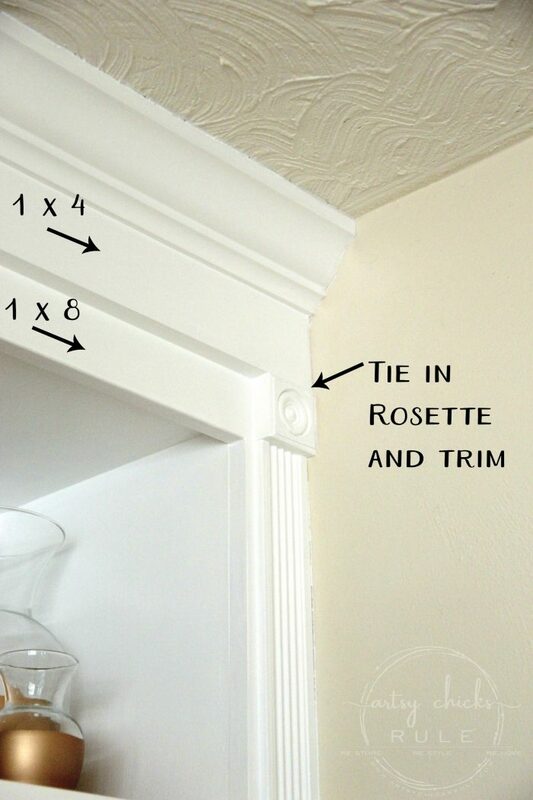 We added 1×4 over the 1×8 to help tie in the decorative fluting and rosette. Otherwise it would have looked awkward just “hanging out” at the top. All caulked and ready for finish paint…..
Caulk really is your friend with things like this. I love a seamless look! A recap to PIN and save for later. I love having a place for all my pretty baskets. 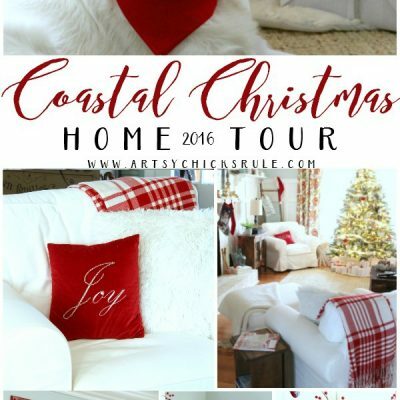 You can find them here …. And I love that it breaks things up a bit too. So even though it took us for forever and day (or 300!) it’s totally do-able. Busy was the only reason it didn’t get done in a timely manner. I don’t even care, I’m just glad it’s done. I hope the DIY Bookcase Tutorial made sense. Hopefully they’ll be up and decorated soon so I can share those with y’all next. Have a great rest of the week friends!!! hey girl love the post! Ryder is just so cute! congrats. And the bookcase is so cool! Awe your new puppy is adorable, lovely story how it all came together Nancy so happy you found him. The bookcases look great thanks for sharing !! Great job on the bookcase…it looks fantastic! Congrats on adopting Ryder! When you lose a wonderful dog that you have loved for years, a new dog in the house has a healing quality for your heart! Of course, you will never forget the one who passed, but Ryder will make it a little easier to live with the loss. Thank you Dorothy! You are so, so right. Thank you for the wise and thoughtful words! 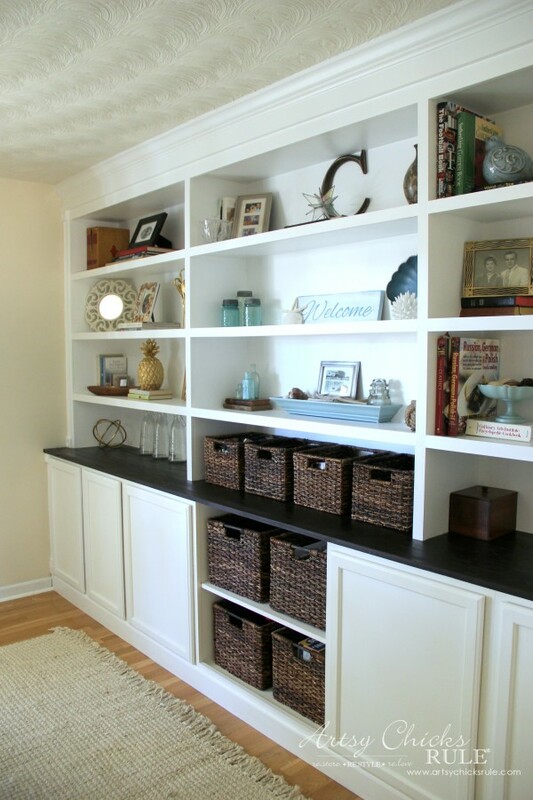 Love the bookcase….do you have an idea of how much you spent in materials? Thanks for sharing! I love the way these turned out. 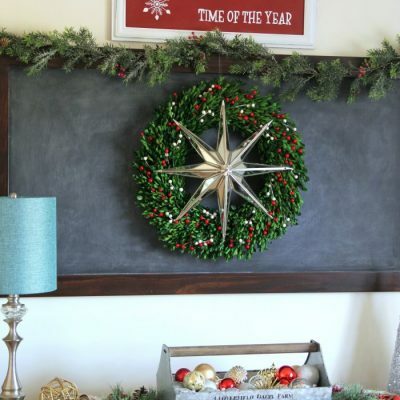 I have painted bookshelves around my fireplace and seeing the rosette and fluting you added gave me some great ideas on how to make it more special. You do such amazing work and I’ve taken much of your advice in my own painting furniture and decorating my home. Love your blog! Aw thanks Michele!! :) Very kind of you to say!!!! I forgot to tell you that I think your new puppy is adorable. I hear you about what a void they leave when they cross the rainbow bridge and how getting a new addition can be so healing. I did the same thing as you did, my rescue is now 10 but she was such a blessing at a time when I really needed her, we adore her. God bless you Nancy and your family. Thank you :) He is a blessing, really. Happy for you and your sweet 10 year old girl too!! They are just so very special in their own, unique way! 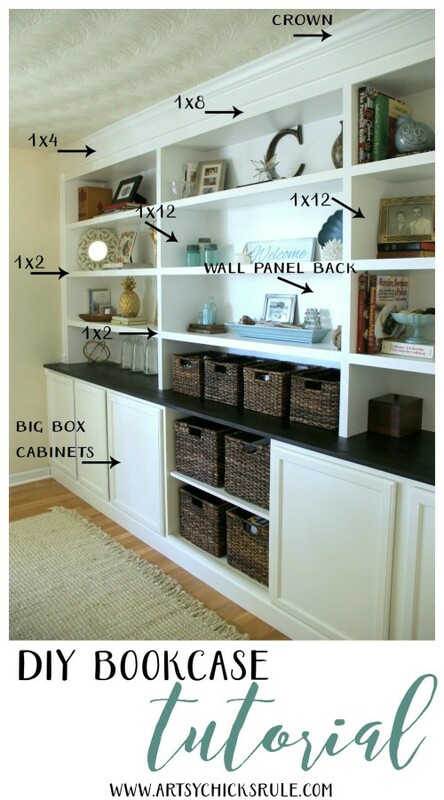 MY first thought on seeing how you extended the cabinets from the wall and didn’t take the bookcases all the way up tight to the ceiling was, ‘what a cool way to make a secret compartment!’ I remember a bookcase that had lots of crown molding and the ceiling and the floor (all shelves, no cabinets) and the crown molding pieces were HINGED, with magnetic catches, which added almost an extra 2 shelves’ worth of space. Your puppy is beautiful – what a face! my fur baby was recently sick and I’m just not ready to say goodbye – he’s all better but gave us a scare! And thank you, so happy your fur baby is all better!! Thanks so much Sue! :) So happy to hear you say that!! This is EXACTLY what I have been looking for for my front room. THANK YOU!. Pinned and emailed to the hubby! Love the bookshelf and Ryder!! He’s adorable!! Thanks so much Crystal! :) He’s a sweetie! The bookcase is absolutely beautiful, Nancy! That’s really all I can say… just gorgeous! And Ryder… oh my, I’ve completely fallen in love with your new baby! I checked him out on Instagram… he’s just a little doll! Aw thank you Karen! :) Oh I bet!! But it’s hard work, lol!! Lots of women have babies later in life these days…I don’t know how they do it!! You guys did such a great job with this project! I know that it drove you nuts to have it partially completed for so long but boy-oh-boy was the wait worth it. We want to do something similar to your project in our office. I’m definitely showing this to my husband and perhaps it will motivate him to get started on our project. I love seeing your precious puppy. Enjoy him! 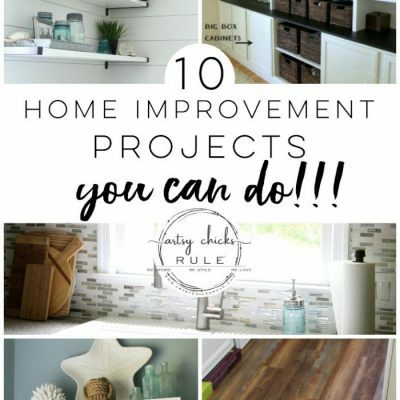 BUT the project is so do-able and can really be completed in a reasonable time frame. 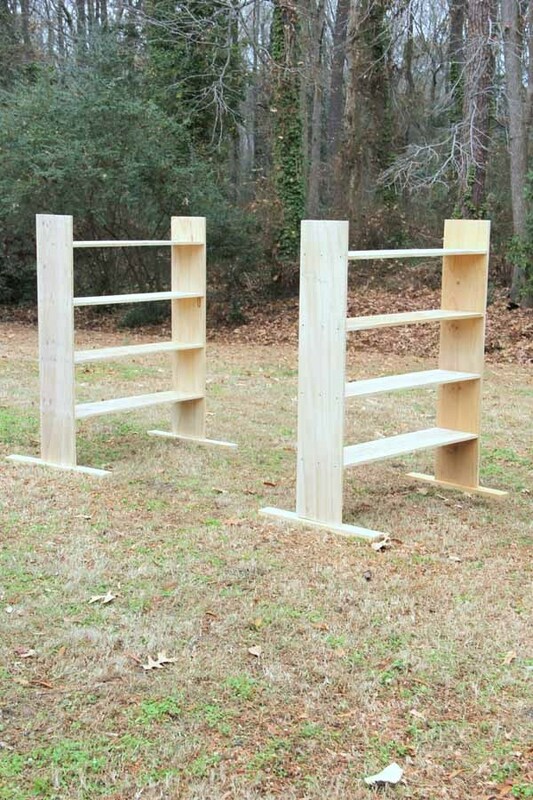 Question on the length of the shelves that you made. 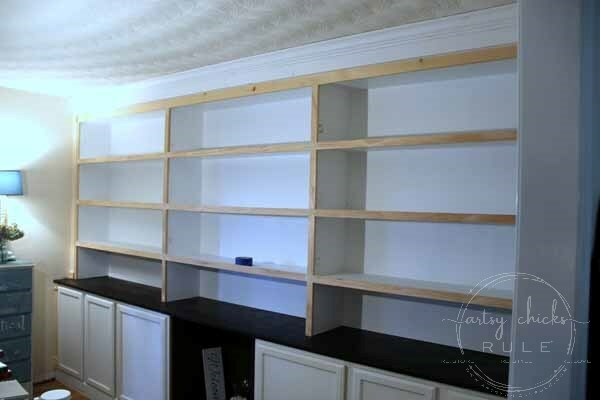 We have a space of 48 inches and would love to make one solid shelf but are afraid that may be too long and not have enough support. What is the length of your shelves? What do you recommend the maximum length being? Have you had any issues with heavier objects bending the shelves? Ours are 48 inches in between. We’ve had no issues with weight or bending. If you use thick enough shelving, that should not be a problem. Also, we created a “box” and secured it from the sides and back before securing it to the wall. There are 2 ways that I suggest doing it. One, you could build a “box” sort of like we did with a frame for the shelf to be secured too. 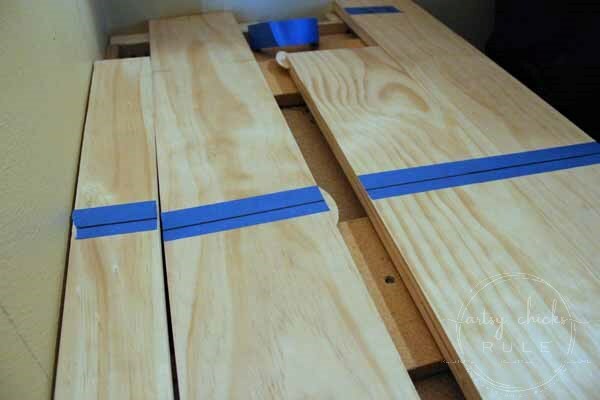 Basically, take two side panels of wood and secure your shelf to those with screws from the outside. 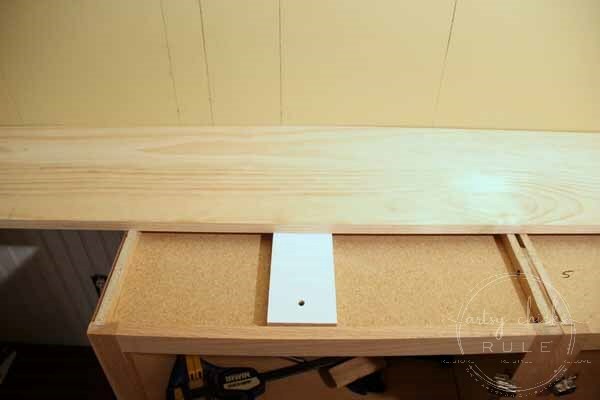 Then add a back panel of wood and secure your shelf to those with screws as well. 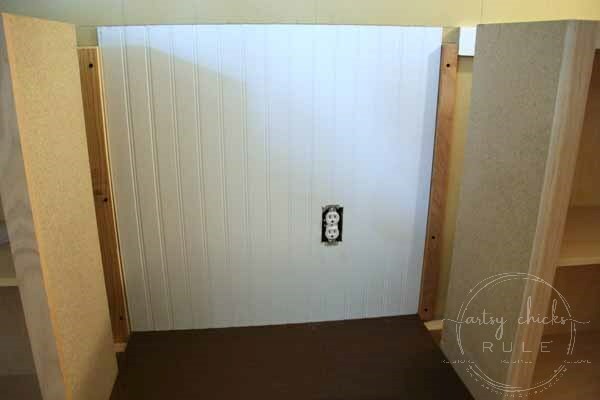 Then place that inside your opening and secure it to the wall with screws. Fill the screw holes, caulk and paint. 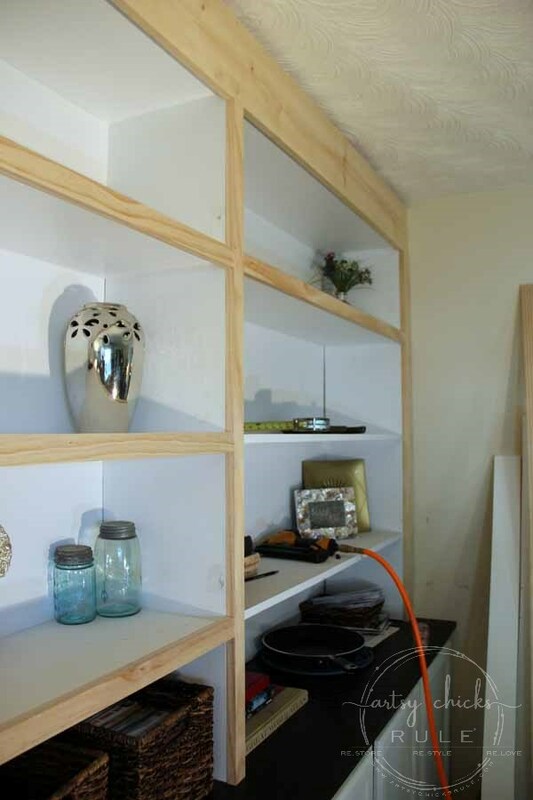 Second, you could skip the wood panels and just add the shelf to the wall and side walls using a Kreg Jig. 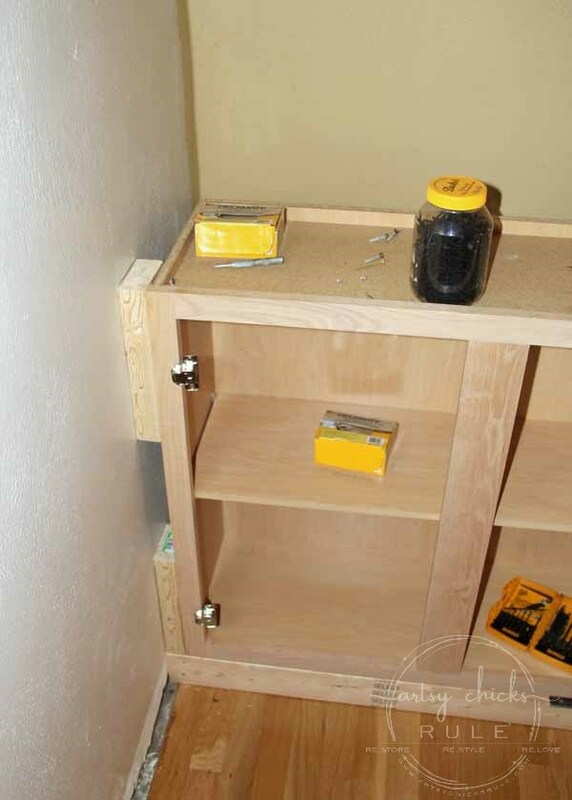 Using a stud finder and the Kreg Jig, screw up into the wood shelf and into the stud to secure. Hope that is helpful for you!! I am IN LOVE with this bookshelf!!! I have been looking for a detailed how-to like this for a while. The hubby and I are going to attempt it! I have a question for you about tools. We have drills and hammers and a circular saw but I am wondering if we will need a table saw and/or a miter saw? Thanks again for the fabulous tutorial!!!! Also, Ryder is so adorable! We have 2 goldens and I just love love love them. I followed Ryder’s Instagram! I miss them being puppies! I am so sorry I missed this comment! I received a new comment on this post and I then saw yours. So, yes, a miter saw would be a good addition for this project. Hi. 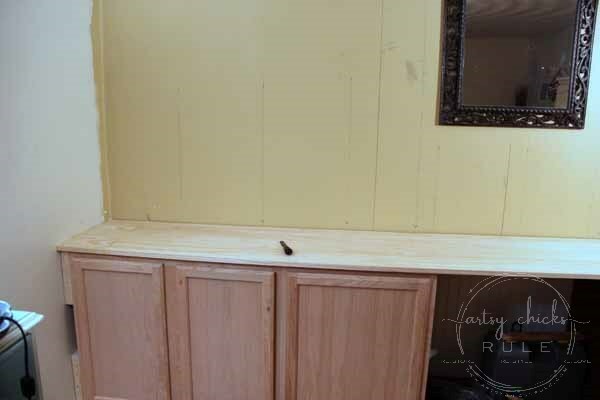 What was the point of leaving space between the wall and cabinets? I’m a new diver and just want some clarification before I tackle a project like this. BTW, your built-ins are magnificent!! This tutorial is so helpful! I like your idea of extending the cabinets out an extra 4-5 inches. What did you do inside with the shelving to prevent things from falling down the back? Thanks so much! Actually, I consider what I have in our bookcase quite important. I have photos of my paternal grandmother, maternal grandparents, my parents, my children, etc. I have rare, very old books (from the 1700s & 1800s), our Bibles, a special wedding gift given to us 26 years ago and quite a few other things that have special meaning to us. Wouldn’t you consider those things important? Sorry you had to give your dog away! Love your puppy. I have a Golden too. They are the best dog ever! Using this design as inspiration for my daughters room. When you secured the bookcase to the wall, did yo just secure them to the sidewalk and each other? Or did you secure them to the back wall? Just wondering how I could accomplish that. 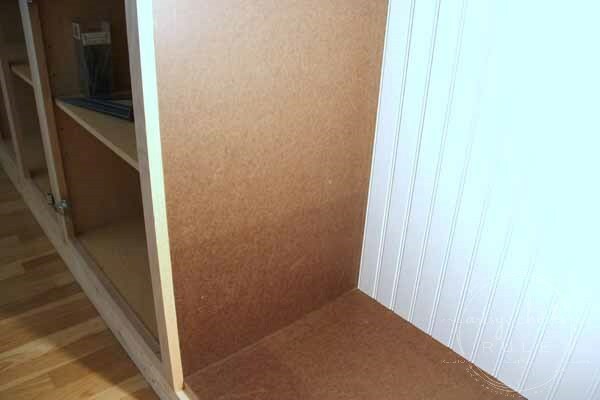 I am using hardboard backing on my shelves. They are secured to the back and sides. 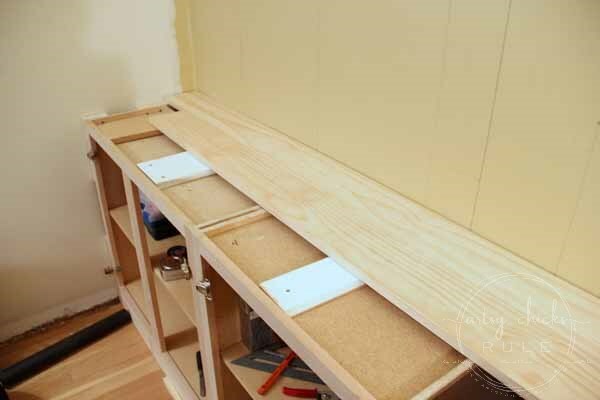 If you look at the photo of the shelf assembly outside, you will see the top pieces extend above the top shelf. A small board was nailed to the back of that just above the top shelf and then nailed to the wall in the studs. Then the side pieces (also up above the top shelf) were nailed into the side walls. 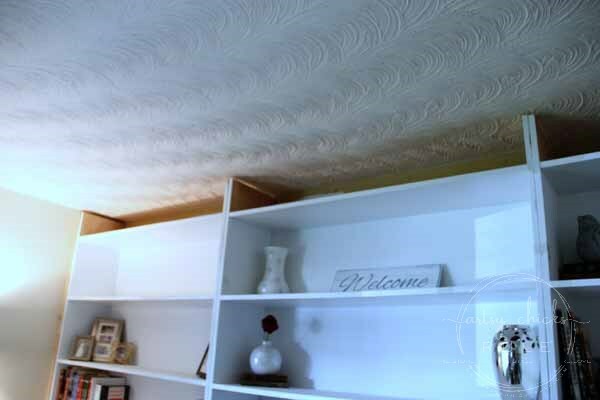 That area above the top shelf where those boards extend were covered up with a 2 boards and crown molding so you don’t see it. But it is very secure this way. :) I hope that made sense. Thank you so much for the detailed tutorial! 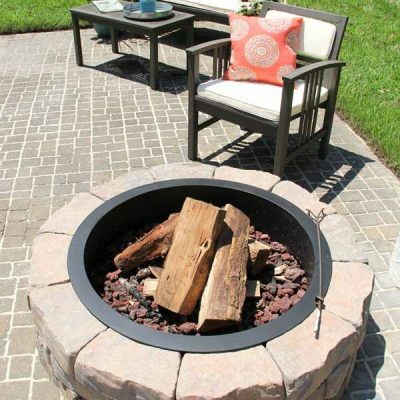 I am going to start this project tomorrow. 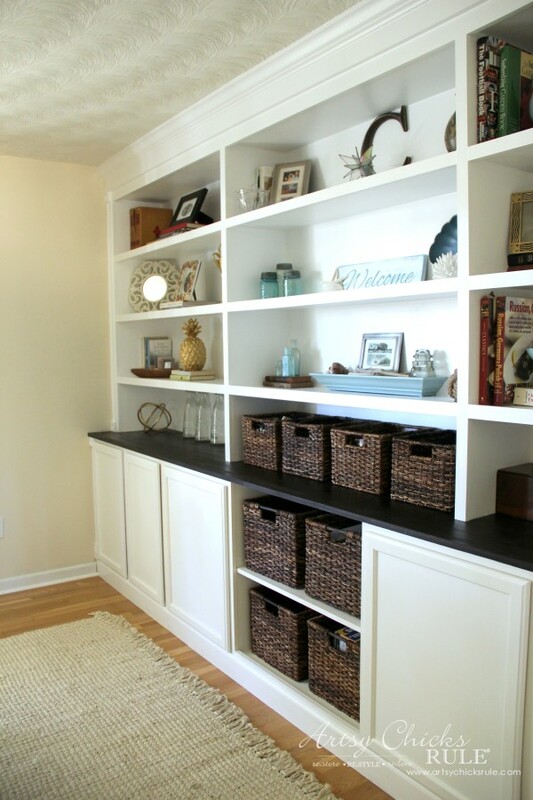 Using cabinets is a great way to get a head start! I have a question. 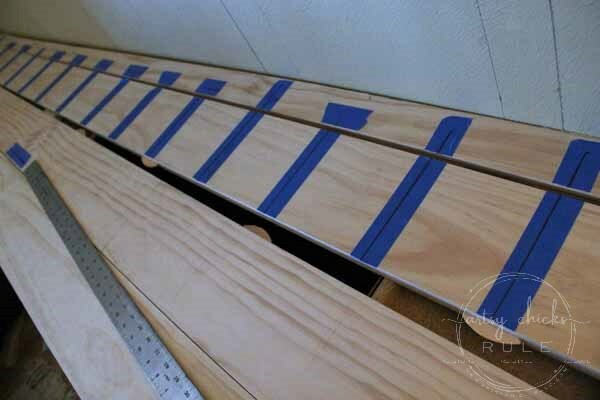 How did you attach the trim pieces? Glue and nail gun? Thank you!